The Portal Bedroom – Page 2 – Designing rooms… with Science!! So the next images I have are with almost everything completed (again, sorry for the lack of in-progress shots… I really do just start, and then don’t stop until it’s almost done!). For the Portal dots, I used the lid of one of the paint-sample jars, made a stencil, and used the laser level to map out where the circles needed to line up. Then I drew the circles on, painted them the base color, did a bit of highlighting (lightened a bit of the paint with the white), then outlined them in black paint, and called them good! While my goal was to be “Portal-themed,” I’m still such a sucker for modern art, my goal was to still try to keep a clean look with all the furniture. Thankfully, I already had most of the furniture, and didn’t buy anything specifically to match the “Portal room.” Any furniture I had/bought, I got because I like the modern/black look. This collection is called “Prepac Brisbane Collection.” When I initially purchased my furniture, I was able to get a twin-sized frame, the headboard, the foot-storage (although the one I got was a bit longer than what they sell in the collection now), a nightstand, and the dresser, through Walmart.com, all for $500. But obviously, the twin-sized frame had been what I bought when I was living in a smaller apartment with less space, and now that I had a place of my own, could finally upgrade. This IKEA Malm bed frame cost $200 ($150 + $50 for the bed slats, as IKEA likes to do). They had this style in a low and high frame-style. I chose the low-style, because I thought it helped make the room look larger, and worked better with having the Chell poster centered above it. I cut out foam board squares, then sketched out various Portal “warning signs” (Which I see everywhere in-game), then got some cheap bookends from Walmart, and taped them to the bookends. And that’s all for the furniture! So in the room there are two types of art: ones on canvas, and ones in poster frames. Everything within poster frames I bought, and the canvas art I painted using 10″ x 10″ canvas squares. I got this set of 4 posters from the online Valve Store for $15. The largest poster is 24″ x 36″, and the other two I used (I decided against including the 4th poster in the room, just to avoid it looking too “busy’) were 18″ x 24” each. I bought black poster frames 50% off at Michaels/Hobby Lobby. The Chell Poster I was also able to purchase through the Valve store, although currently it doesn’t look like they are selling it anymore. I really liked seeing this in Portal 2, and when I saw it was a giant poster, knew I wanted it as the “centerpiece” above the bed. These are the canvases I painted. My thought-process was to put the arrow and “Exit” sign above the bedroom door (since technically that would be the “exit” from the room), the cake sign above the closet (and had the “Cake is a lie” scribble inside). I wanted to put stuff above the curtains, just so I’d have the art evenly spaced throughout the room, so I decided to be creative and just do an Atlas and Peabody one, then an Aperture logo, and paint them orange and blue rather than just black (I used the same orange and blue paint as what’s on the walls). And the “Cake is a lie” closet! This idea really did just hit me one Sunday afternoon… I think I was watching Doctor Who or something, and got this idea, and just ran into my room, slapped some black paint on my hand and went at it. I thought about doing more graffiti, like a flying companion cube or something (like in the game)… but got bored after the few tally marks and called it good :). The light blue pillowcases were part of a sheet set I found on one of those online Groupon deals for $30. And of course, the “Crown Jewels” of the room: The Portal guns. These… were surprisingly difficult to procure (and quite pricey too!) When I heard they were being sold, I took my time in trying to order one, only to find out they had sold within minutes online. So when the “original gun” sold out, I tried to get the first round of the “Special edition” one… only to have that one sell out before I could grab it. Luckily, I was able to buy the Orange special edition gun… for $150 (ouch.) but considering how cheap I was able to purchase/receive as gifts everything else, I figured it was worth the investment. 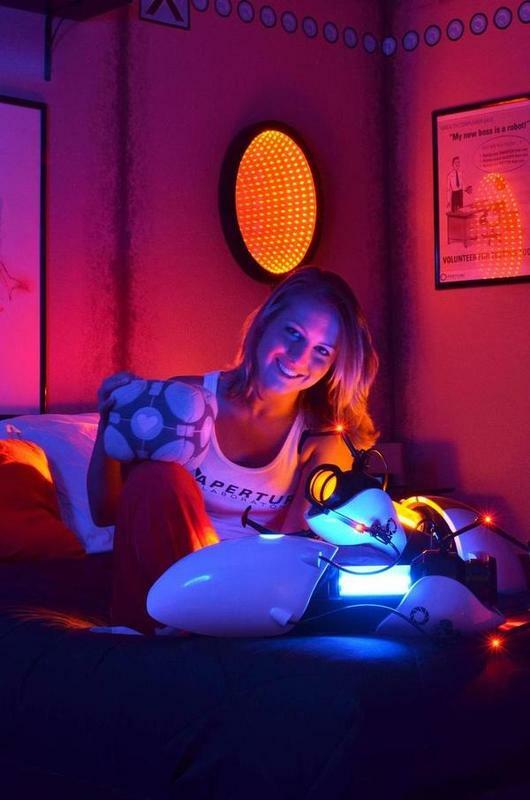 Shortly thereafter, they produced a Portal Gun you can customize for $120 (although at the time I was able to get it for $90). It might have been overkill to have 2 portal guns, but I felt a whole lot more comfortable running around at Halloween and conventions with the non-special-edition gun. Honestly, however, if you’re wanting to do a room like this for a kid or something, Thinkgeek.com has a Mini-replica Gun for $60 that I think would be a lot more reasonable than breaking the bank for a “full-size” gun that you’ll probably be too afraid to handle with how expensive they can run (although I think you can find them on ebay for not too ridiculous a price). So all in all, these were EASILY the most expensive part of the room, but I think they were worth it. Mind you, I know that dozens of people have made infinity mirrors of their own, and there’s tons of Youtube videos showing how, but I DARE you to find me one where they make an oval infinity mirror. Such a tuitorial doesn’t exist. And you know why? BECAUSE IT IS SUCH A PAIN IN THE BEHIND! I mean my goodness, I don’t think either of us realized what we were getting ourselves into. With a square or circle mirror, you can find everything pretty standard… standard frames, glass, mirrors, LED strips, etc. Little to no construction necessary! But with wanting to re-create a Portal look… EVERYTHING had to be custom-made. I had to order custom-sized glass and custom-cut mirrors. We had to make our own frame and glue it all together. The standard LED strips were all the wrong sizes, so we had to buy the individual bulbs and solder them all together individually. The wiring, one-way reflection, and switch… everything was made from scratch. Eventually he’s going to do a more in-depth guide as to how we put together the Portals at http://stevegilbertson.com (he’s getting married soon, so he’s pretty busy dealing with all that planning stuff currently), but for now you can be entertained with some in-progress photos! Yes, we actually did use the “For Sale” sign… it was actually the perfect material to make the LED strips. Checking to make sure the “strip” would fit within the portal frame. One of the many pieces we cut for the frame… I had no clue what he was doing here. Staring the soldering of the many many LED bulbs. Oh, and we had to sand them first… guess who’s fun job THAT was! Once the LED strip was done, we could glue the frame together… clamped it together with wood glue for 24 hours. Both the orange and blue portals done… the orange is “on,” the blue is “off” for comparison purposes on how stinkin’ cool it looks! Aaaaaand we have portals. FOR SCIENCE!